David Zwirner is pleased to present Cut, Folded, Pressed & Other Actions at the gallery’s 537 West 20th Street location. This group exhibition will highlight modern and contemporary artists who utilize paper as a site of rigorous formal and conceptual inquiry through direct manipulation and engagement with its materiality. 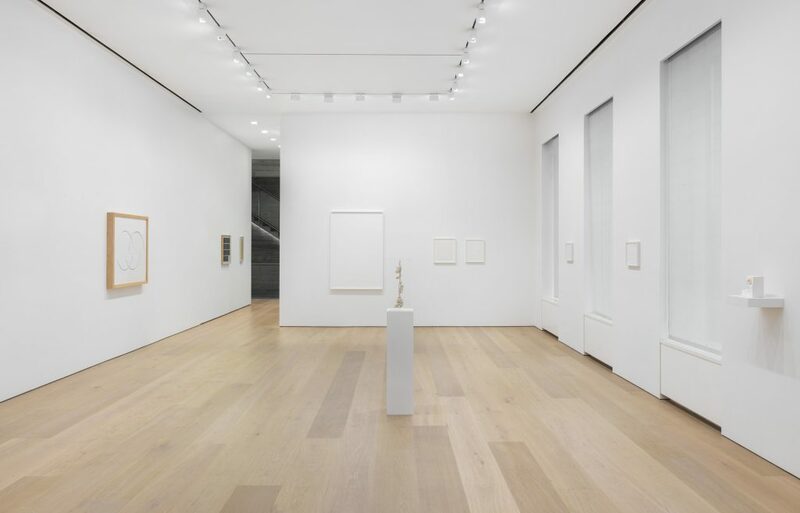 The exhibition includes work by Noriko Ambe,Hans Bischoffshausen, Enrico Castellani, Célia Euvaldo,Fernanda Gomes, Oskar Holweck, Vlatka Horvat, Sol LeWitt, Marco Maggi, Anna Maria Maiolino, Gordon Matta-Clark, Eleanore Mikus, Joshua Neustein, Arthur Luiz Piza, Fred Sandback,Mira Schendel, Günther Uecker, and Ignacio Uriarte, among others. 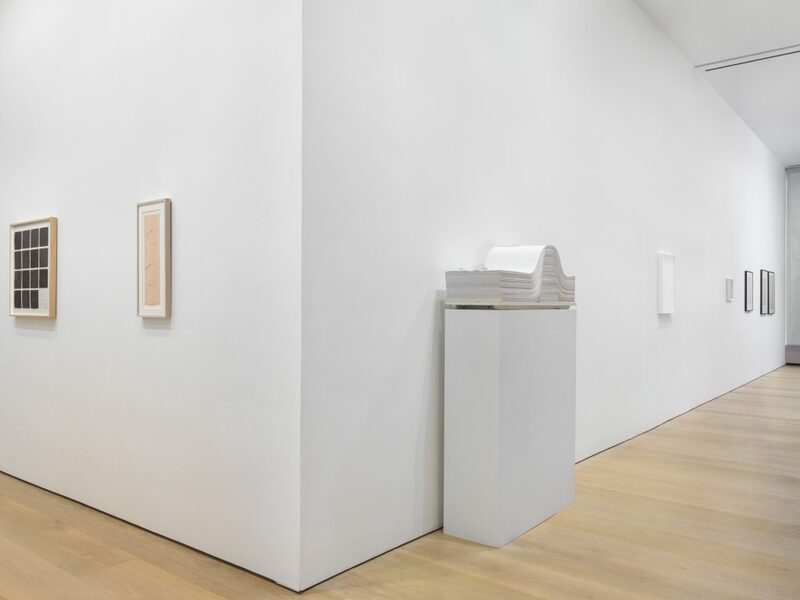 Paper, the traditional support of drawing, came to occupy a particular position in conceptual and minimalist practices during the 1960s and 1970s with the rising interest in process and materials. Given the ubiquity and malleability of the medium, artists have continued to interrogate its fundamental properties, formal qualities, and its broader artistic and cultural associations. 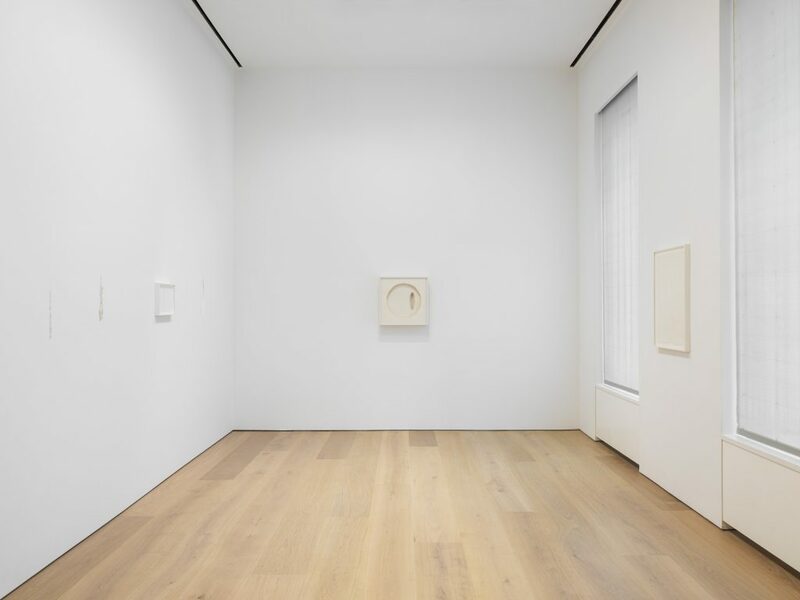 As the title of the exhibition suggests, many of the works on view evidence the active hand of the artist on and within their very surface, thereby complicating notions of drawing as necessarily dictated by conventional modes of mark-making or graphic lines. 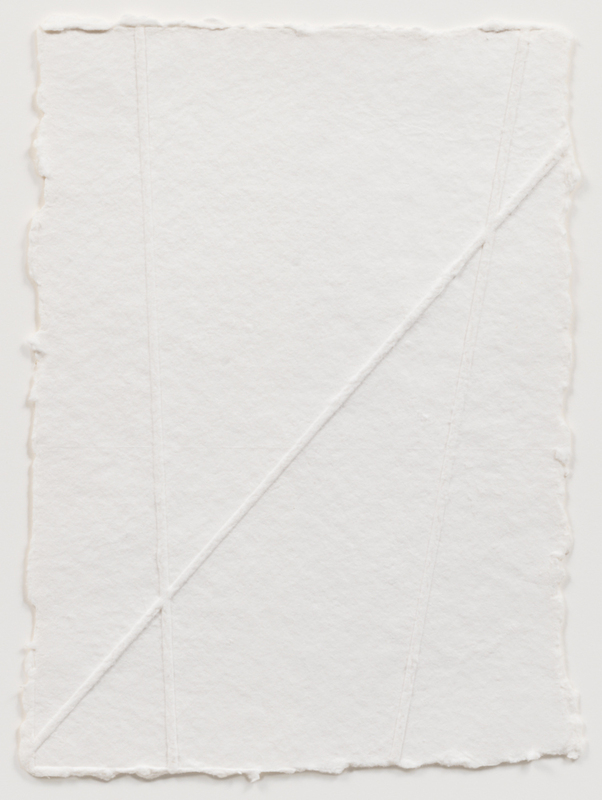 In the artists’ arrangement of paper in space or in the deliberate manipulation of the sheet(s) using a wide range of aesthetic tactics such as tearing, puncturing, rolling, and pressing, these monochromatic works present subtle and varied investigations of light, space, composition, and materials. 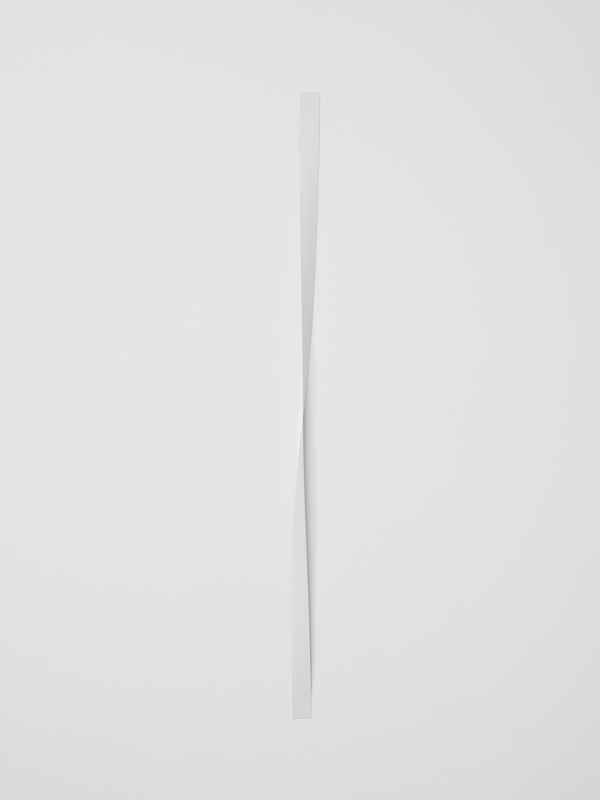 The performative gesture of puncturing, tearing, cutting, and pressing the surface of the paper is central to many of the works on view, but it is especially crucial to those made by artists associated with the Zero Group who are known for works that transform the two-dimensional plane into a three-dimensional relief. 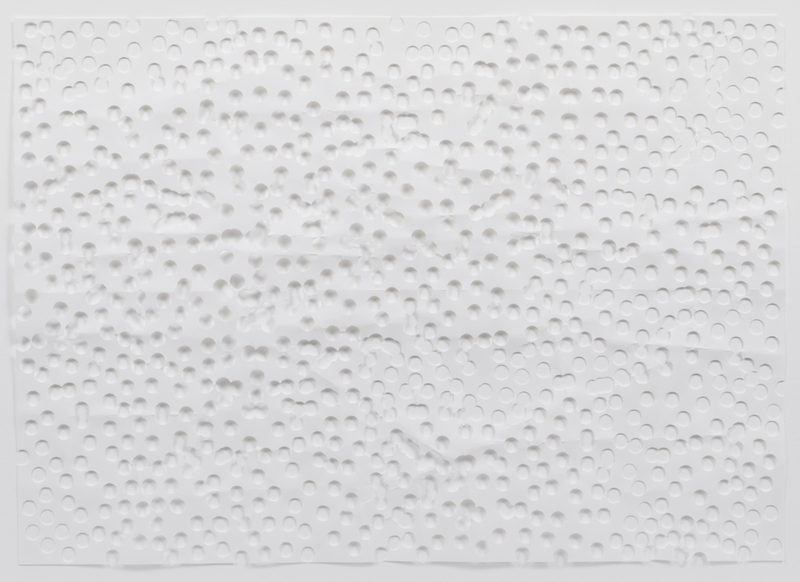 Hans Bischoffshausen (1927-1987), in his “papiers sculptés” (or, “sculpted papers”), pressed and punctured plain white cardstock and paper with a sharp tool to create deftly modulated, monochromatic surfaces whose treatment of light and surface vary from the highly regular patterning of Enrico Castellani’s (b. 1930) paper reliefs. Oskar Holweck (1924-2007) repeatedly tore accordion-like folds across the surface in carefully considered compositions leaving behind rows of ragged, tactile triangular forms. The organic distribution of tears and cuts in the works by Günther Uecker (b. 1930) and, though less directly associated with the Zero Group, Arthur Luiz Piza (b. 1928) suggest an inherent dynamism and movement in the material beyond the artists’ hands. In other works, the artists have left the paper entirely intact, using folds and creases to draw within the paper itself. In Sol LeWitt’s (1928-2007) Fifteen Folds, Vertical, Horizontal, Diagonal Left and Right, and All Their Combinations, 1976, as the title suggests, the artist has demonstrated and recorded all of the possible combinations of folds on square pieces of paper, reflecting his interest in basic, geometric forms and self-generating systems. The endless folds in Eleanore Mikus’s (b. 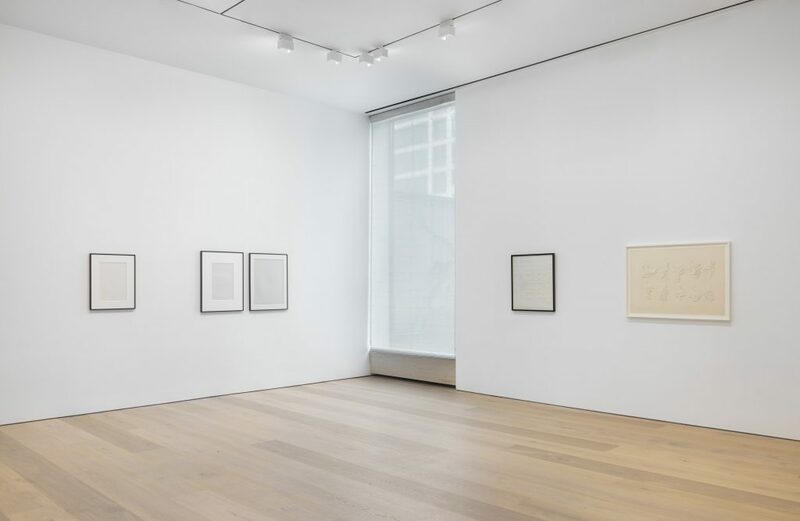 1927) works often produce grid-like compositions reminiscent of the refined geometry of Minimalism; yet, the trace of the artist’s hand in the act of folding and pressing, as well as the softness of the Japanese Inomachi Nacre paper she often uses, contrasts with the refined finish of her Minimalist contemporaries. Vlatka Horvat’s (b. 1974) modified sheet of A4 paper investigates unfolding and uncreasing, or drawing through the undoing of the act of folding. The sculptural and phenomenological possibilities of paper are evident in the varying considerations of density, weight, and scale presented by a number of artists in the exhibition. In his cut drawings from the 1970s,Gordon Matta-Clark (1943-1978) extracts space by meticulously slicing through thick layers of paper in a process that parallels his architectural interventions, whereas Noriko Ambe (b. 1967) layers hundreds of individually hand-cut sheets of paper in her series “Linear-Actions Projects by Drawing and Cutting” to map both physical and emotional geographies. Anna Maria Maiolino (b. 1942) creates a “drawing object” by layering sheets of torn paper to suggest an infinite spatial recession, which serves as a counterpoint to the flat, ever-evolving shadows cast by the minutely cut three-dimensional relief elements in Marco Maggi’s (b. 1957) intricately detailed panels. 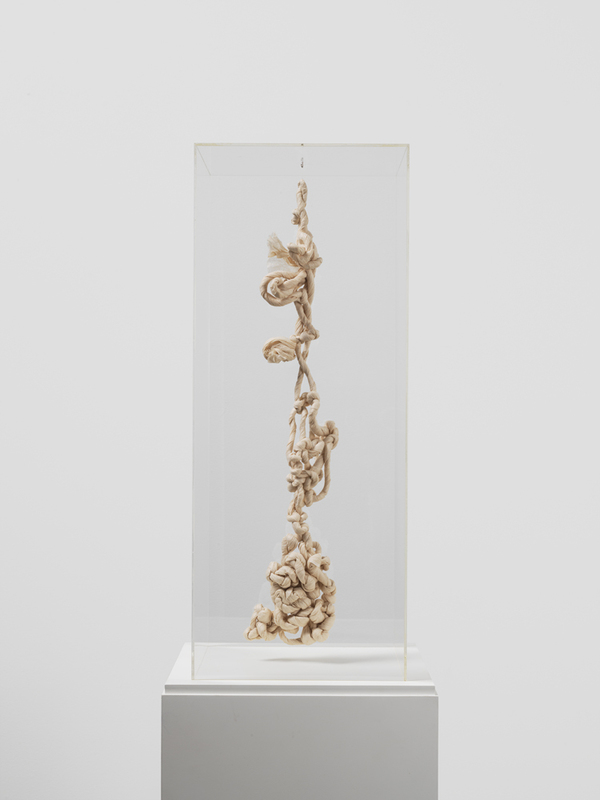 Paper becomes line and line becomes paper in Mira Schendel’s (1919-1988)Droguinha (Little Nothing), 1986, made with twisted, rolled, and knotted Japanese paper and hangs suspended in the air, effectively creating a drawing in space. In contrast to the gravitational heaviness ofJoshua Neustein’s (b. 1940) torn and cut works, the paper of Fernanda Gomes (b. 1960) hangs loose and light, arranged to emphasize its objecthood and relationship to the viewer with little to no intervention on behalf of the artist. 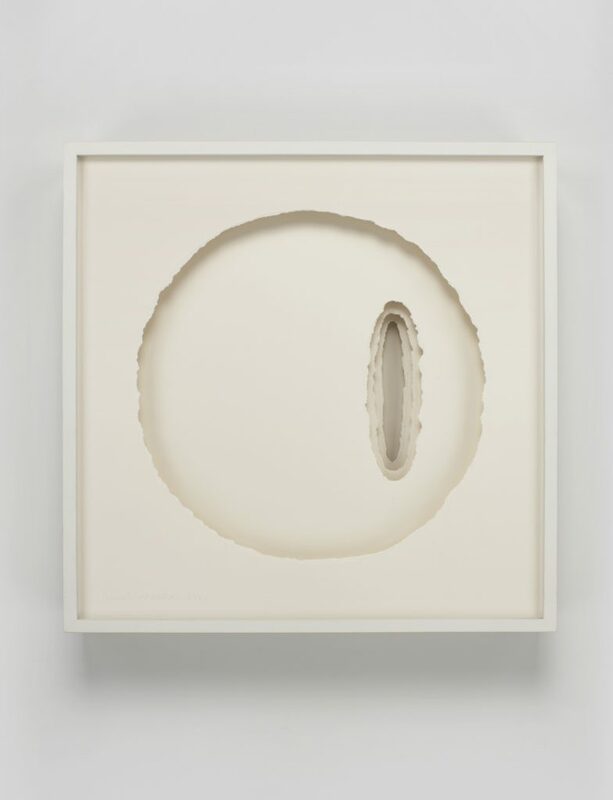 Other artists present the elegant subtlety of slight textural variations on the surface of paper alluding to the quiet, contemplative possibilities of the material and of drawing more broadly. Ignacio Uriarte (b. 1972) creates poetically poignant drawings in his series “Monochromes without ink” by employing an empty pen that, instead of transposing ink, leaves behind a ruched texture. Célia Euvaldo (b. 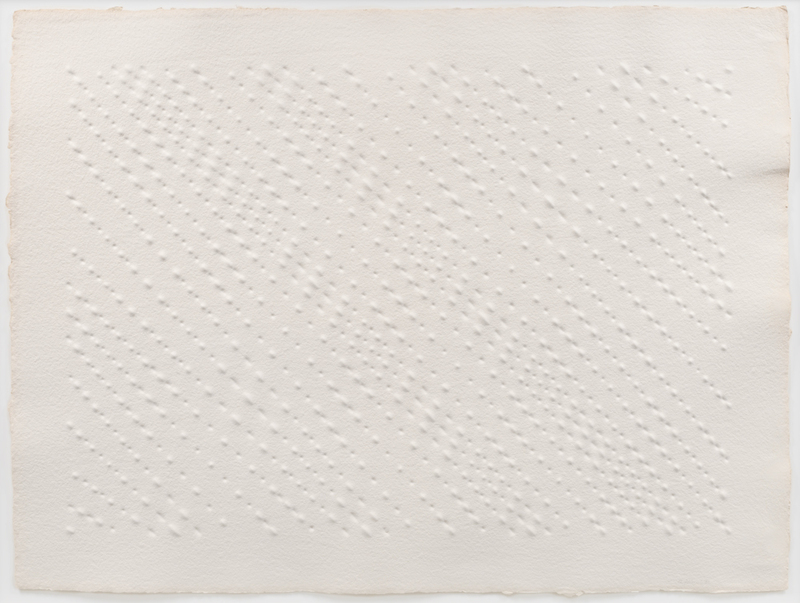 1955) manipulates the surface of delicate silk paper to create subtle ripples that reflect and absorb light. 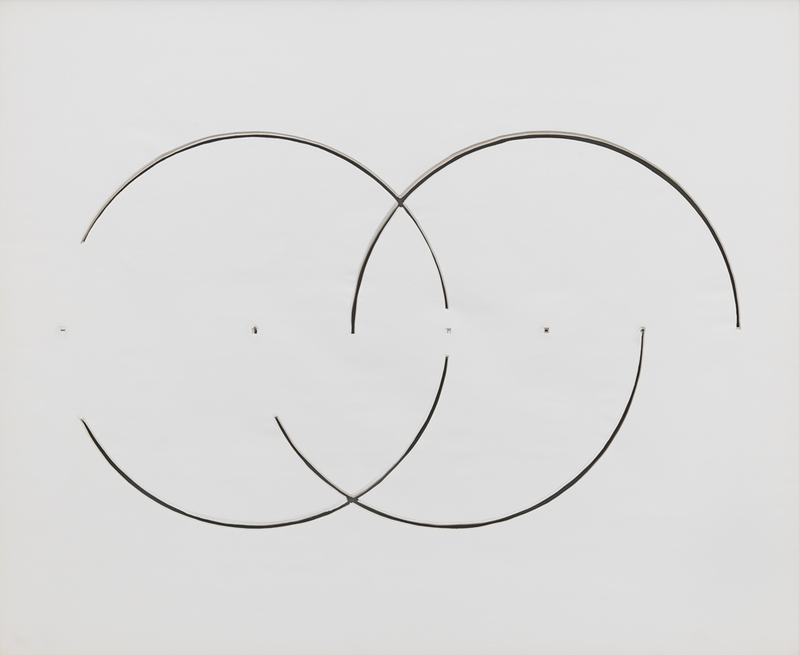 Rare inkless embossings byFred Sandback (1943-2003) relate to the physicality of line and space that the artist is known for in his sculptures, in that the lines pressed into the handmade paper become three-dimensional elements casting a slight shadow beneath them.